Wow. I don't need to add anything. I just need to come visit this and remember it every five minutes. What crutches do I rely upon? Not My Job - Somebody Will Do It. Excuses - But I'm Busy! But I'm Special! But I Didn't MEAN To. God, make me willing to let go of my crutches, today, right now, every time I can. And make the "can" come more often. Amen, so be it. The Big Book speaks of "grasping and developing a manner of living which demands rigorous honesty." (Alcoholics Anonymous, page 58) My dictionary says grasp means to seize and hold firmly. How do you grasp a manner of living? I'd decided to do more program-related reading this year, and I picked up Chuck C.'s A New Pair of Glasses. Though I've bought the book twice, I guess this is the first time I got this far (10 pages?? Something like that) reading it. But I've spent lots of hours listening to Chuck C give the speech next to my ear. And this is early enough in the book/speech I was usually awake. But I never "grasped" this part of the message. 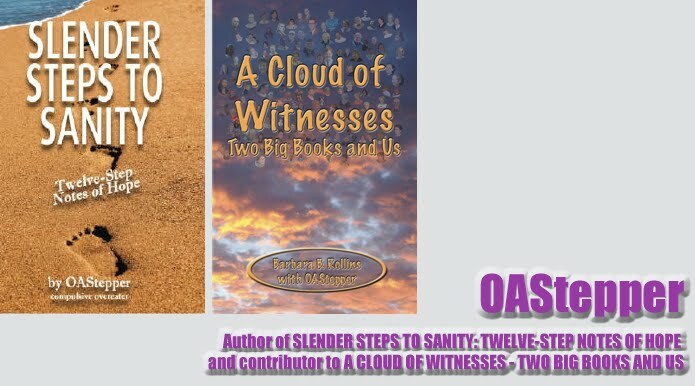 Chuck said this was essential, that without grasping and developing the manner of living of the Twelve Steps, we fall back into the chaos from which we came. So, it must be possible to grasp recovery. How do I go about that? Well, I read program literature. I act as if when I don't want to deal with the program. I start each day reflecting on where I am, where I'm going, and Who is going with me. Amend what. Who I'm going with. I get really serious about the Tenth-Step stuff "on retiring." I realize when I'm not rigorously honest, I'm not grasping and developing the right "manner of living." The proof is in the pudding, in other words. Well. Not the pudding, unless it stays on the shelf. And that's another issue for me. I've been finding too much comfort in sugar-free pudding. When I get rid of the stash in the pantry I'll..... No. No more pudding when it's not part of a meal shared with other people. No private puddingfests. I don't like this number. We've got nine tools now in OA: abstinence, meetings, phone, writing, anonymity... Looks like I need to work on using the tools when I can't even list them. They are: a plan of eating, sponsorship, meetings, telephone, writing, literature, anonymity, service, and action plan. I do pretty well on the plan of eating at this point (well, pudding not included), and I'm working on adding to the Voices of Recovery and For Today I normally read each day. I'm determined to blog weekly as a way of writing as well as of service. I call my sponsor and I sponsor regularly. I go to a meeting regularly, could add other meetings but don't. Anonymity I've got down. Service I do fairly well. An action plan? I ordered walking shoes yesterday. And that ton of a telephone. Sigh. Okay. Use the tools. Nine of them. I think I have the picture. And believe me, this is an example of rather rigorous honesty. Sigh. So. I've read what I wrote last night. And I've remembered the night. But I remember no startling revelation. Okay, sitting here, what comes to mind is the idea of "Don't look at me." The last month has been an embarrassment because I was making a major change in my life and I've been praised by people I barely know, gifted by people I'd rather not be indebted to, in the limelight way too many times. I don't like the limelight. That's funny. I certainly enjoy public speaking. I have been a public figure for years, intend to be for many more - and perhaps in an even more ostentatious format. But when I speak, when I appear in a public setting, I'm in charge, in control. If I were small? If people whistled at me? How ridiculous. I'll soon be 64 - not exactly whistle bait no matter what I might weigh, ten pounds less than my goal weight or even more! (Or does that count as less??) I couldn't possibly be hiding from such, could I? This has been open several hours. My answer is, "I don't know." But I know I can't do it. I know God can. And I know I intend to let him. I weigh a hundred pounds and change less than I ever weighed. But a part of me feels like a fraud since I wrote Slender Steps to Sanity really quite early in my tenure in OA, after I'd lost this weight, but before I'd reached an ideal weight for my size. I still weigh between 195 and 200 - but LESS than 200. That wasn't true a couple of weeks ago. My abstinence has been solid since Christmas Eve. But before that, spotty. My sponsor pointed out I could get 30 days but pretty soon after that, I slipped. The slipping got rather drastic during this fall in the midst of some stressors. That's no excuse. Well, it is. It's an excuse, not a reason. It's a justification for not being who God would have me be, who I would choose to be. But would I choose it? Do I really want to be an ideal weight for the first time in sixty years or so? I know when I was 13, about 1960, Mother took me to a doctor who prescribed weight-loss pills. So I was on a diet from then until I found OA December 17, 2006. When was I an ideal weight? I remember about 1957 playing "Red Rover, Red Rover" and running when someone called "Let Fat Domino come over." I wasn't mad at him. I was mad at me for running. And for failing to break through. I was asked today just what I'm trying to protect myself from in not moving the rest of the way to what I would swear to you I want - to weigh something near 140 or 145. Am I that stubborn? Darned right I am. Have I really thwarted myself all these years? Obviously. Have I done it intentionally? Define intentionally. The dictionary says "done on purpose, deliberate." So? The other question she asked is what I'm afraid of if I were to weigh that. I don't know. I'd answer no, but I do recognize the prevalence of fear, the pervasiveness of fear. I sit here, having had three meals and nothing else today. That should be the norm. It has not been. I've been having something after supper. And still losing. But I knew - said to my food buddy last night - that wasn't something I should be doing. As I sit here knowing that - at 11:07 PM, I want to fix it. I want to get what I deserve. I deserve food. Baloney. Well, no. I don't eat baloney. I don't need it. It's cold, we've been in the bedroom, heating only one room, so my behavior differs than when hubby goes to bed and I'm left up, alone. It's not hunger that leads me back to the kitchen. Boredom? Not really. Entitlement. "That which is morally right, just, honorable." It's not. It's not morally right, not honorable. Why do I feel entitled to it? Auburn has won the national championship. So what are they entitled to? I don't know the answer. God, give me the answer. Relieve me of my fears and show me who you would have me be. And I'll continue this tomorrow, answers in hand. The resentment's not new - no, it's ancient. I've overcome it before, grown past it. I can do it again, will do it again, am doing it now. It's a justified resentment. I have not always known than, tried for decades to become the person who wasn't treated so badly. In the process, I was told I was passive aggressive, the first time I'd ever heard the term way way way back when. It was defined then for me as "I don't get mad, I get even." Truth be told, I never got even by doing poorly what I was ordered to do, by thwarting through seething anger. I never really found peace until I found the Steps. In the rooms of recovery, I learned I didn't have to accept anybody else's opinion of me, that I could be more than he thought I was, more than I thought I was. I am not limited. God is not limited. God, give me the serenity to accept what I cannot change - him, his opinion of me, his treatment of me. Give me the courage to change what I can change - me, my opinion of myself, my treatment of him, my attitude toward him, my rejection on his attitude and opinion of me. Give me the wisdom to know the difference. That's happening, again. I went to sleep listening to Joe and Charlie, came back to bed to the discussion of unearned (they used some other word) resentments. So, God is giving me the wisdom I need. Again. I will release the weight of resentment, and I firmly believe that weight has been making my knees hurt. I claim good health and happiness for this, my new day, my new year, my new life, resentment free. Thank God. I will not be mad, not even even. I'll soar past and fly.